According to statistics, the average woman will change dress size 31 times during the course of her adult life. Having children, moving in with a partner and the first few years of marriage are life events often associated with piling on the pounds. Meanwhile, men cite stress at work as the reason for their weight yo-yoing. There are always those areas of fat that just cannot be shifted by exercise and diet alone and sometimes, our genes can let us down. It is, therefore, no surprise to learn that liposuction is the fifth most popular cosmetic surgery treatment in the UK – for both sexes. It targets and removes fat from the bottom, hips, stomach, love handles, saddlebags, thighs, calves and ankles, back, arms and neck. Liposuction extracts unwanted fat safely and efficiently – the amount of which is based on an our body status that will be assessed by the clinician we choose to carry out the treatment. However, don’t expect to see results straight away! It’s also important to note that the amount of fat that can be removed from any one area is limited – not only by what is safe (namely, a maximum of three litres) but also by natural limitations. Adults within 30% of their ideal weight who have firm, elastic skin and good muscle tone are considered the best candidates. The results of liposuction are usually long-lasting but, like all invasive surgery, it does come with risk. So, what are our non surgical options? 3D-Lipo is a three-dimensional fat-zapping procedure. It’s a non-invasive solution to fat removal, the treatment of cellulite and skin tightening on both the face and body. 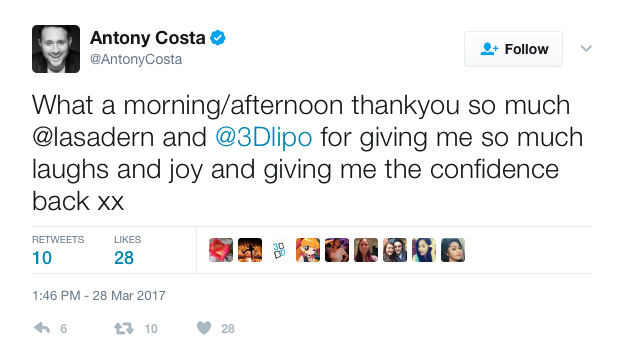 3D-Lipo has several combinations of treatments tailored to treat your specific stubborn fat areas, loose skin and cellulite on a long-term basis. Ultrasound creates a wave that breaks down the fat cells, causing them to turn into liquid, which is then processed away naturally by the body. Cryolipolysis involves the freezing of fat cells. A cooling pad is placed over the area and the suction mechanism of a handpiece draws up and holds onto the fatty area between two cooling sections. By lowering the temperature so drastically, heat is extracted from the fat cells causing them to die without any damage to the skin or other surrounding areas. Radio frequency concentrates on skin tightening on both the face and body. The device is run over the skin to heat the skin tissue and promotes the production of new collagen, resulting in firmer skin. 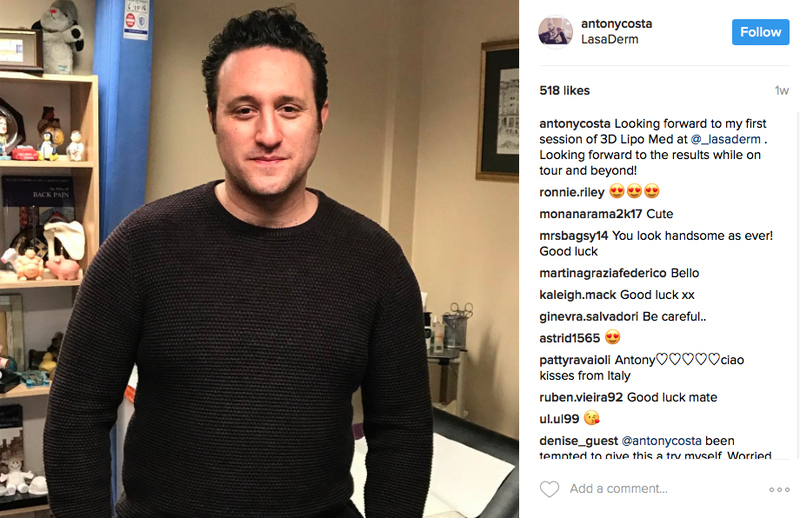 This week, Antony Costa, of boy band Blue, revealed his confidence was recently boosted by undergoing the treatment. It may be in readiness for a reform tour – the boys hit their heyday early 2000s and are about to get back together to perform a handful of gigs. Back then, Antony had a chiselled torso but time takes its toll and now he is very happy with his new shape after treatment, having frozen off six inches. Other celebs who have extolled the virtues of the non-invasive treatment include Coleen Rooney, Amy Childs and TOWIE star Gemma Collins. Without invasive surgery, patients can lose fat – and 3D-Lipo gives the appearance of a toned abdomen instantly. The result should last at least nine months. And, unlike invasive liposuction, there is no bruising, pain or recovery period.